Maybe not your first guess at the side hobby of your neighborhood water treatment plant operator, but more likely than you’d think. 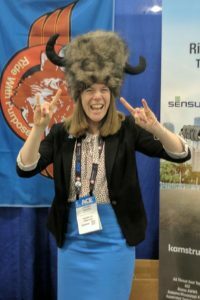 I want to introduce you to, hands-down, the coolest supporters of the Community Engineering Corps program: Ride With Purpose, also very affectionately known as the Water Buffalos. More than just a group of motorcycle enthusiasts, Ride With Purpose is a registered 501(c)(3) non-profit organization that raises money and awareness for other non-profit organizations that provide for safe drinking water, sanitation services and environmental stewardship to communities in need. As a big fan-girl, you can imagine how excited I was to get a chance to sit down with Water Buffalo #55, Tim Wilson. Tim explains that the Herd has existed for 12 years, and in that time has raised over a million dollars for the cause. “Not bad for a bunch of bikers,” he says. Tim has been riding with the Herd since 2013. He joined the group due to some positive peer pressure from pal, Sandy Smith. Sandy had joined the year prior and in 2013 the two were on the American Water Works Association (AWWA) Board of Directors together. These intimate views into nationwide conditions inspired Tim and other Buffalos to take an interest in Community Engineering Corps (CECorps). 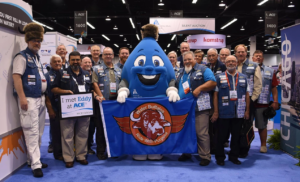 Tim, Sandy, and Ali Mahan were all on the AWWA Board of Directors and the Ride With Purpose Board when the CECorps program was launched in early 2014. They knew it was a program that would speak to the Herd, and they started sharing more about it and getting involved. Tim is an active reviewer for the program’s Domestic Application Review Committee. He and Sandy both serve on AWWA’s Community Engineering Corps Advisory Committee, a committee of advocates that get their peers involved in the program in meaningful ways. Tim recognizes the need for volunteers, and as a trained operator and manager, he’s able to bring a different perspective to the table. Ride With Purpose has also added Community Engineering Corps to the programs they support financially. A $20,000 gift from the Water Buffalos set the program up for success in 2017, allowing new volunteer teams to impact many communities with water sector needs. Again in 2018 the Herd has renewed their support of Community Engineering Corps with another $20,000 donation. Their passion for the program is “donor-driven,” Tim says. “Donors want to see domestic work as well as the great work that Water For People does globally. CECorps is a perfect match”. Tim and the entire Herd are all volunteers, all taking to the open road on their own dime. 100% of donations and sponsorships raised go toward supporting programs like Community Engineering Corps. Can’t ride a bike, but still want to make an impact like the Water Buffalos? Tim says it’s as simple as raising your hand. “Just say I’m willing to help, you will always get more back than you give”. For more ways on how you can “raise your hand,” hop on over to our Volunteers Page, or visit the Water Buffalo’s webpage at www.ridewithpurpose.org to learn more.